Space Shuttle has been orbiting the earth in the second half of its flight. 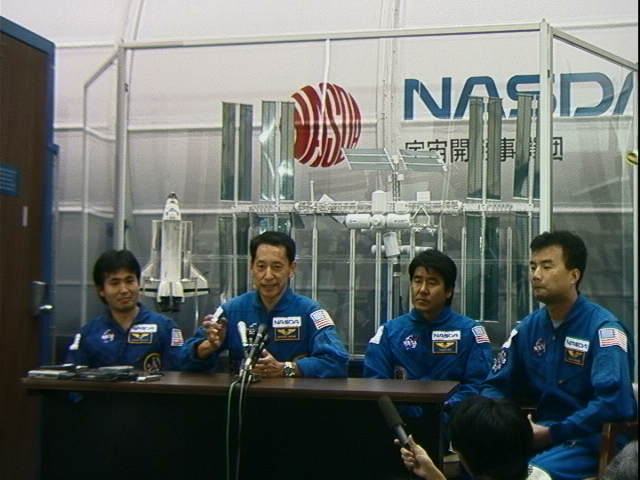 Crew members were awaken by a Japanese song in honor of Payload Specialist Chiaki Mukai. In response to the call of "Ohayou Discovery (in Japanese)" from the ground, Chiaki called back as "Ohayougozaimasu (in Japanese)"
At 2:55p.m.she received a phone call from Prime Minister Keizo Obuchi and Minister of State for Science and Technology, Yutaka Takeyama. Chiaki mentioned her thanks to many people that she could have such wonderful opportunity, and by using her hands she expressed her message "Thank you for your encouraging messages. My working place is in space." to the people including those who are disabled to hear. She conducted the experiment using two toadfishes, plant experiment, operated high vision camera and performed routine exercises. Tonight she will once again wear a sleep net and a sleep suit which monitors respiration, eye movements, muscle tension and so on. 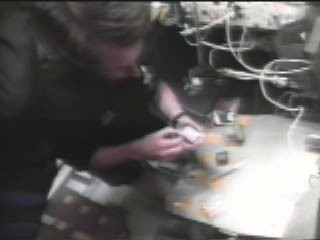 Astronaut Mukai pulled out the fish packages, each of which a toad fish is located in, from the Vestibular Function Experiment Unit (VFEU), and gave them a movement manually. This acceleration enables us to see the change in neural activity where these fish packages are under microgravity / acceleration condition. For plant experiment photographs are being taken. Early this morning prime minister Keizo Obuchi, head of the Science and Technology Agency Yutaka Takeyama and astronaut Chiaki Mukai talked together via a communication link connecting Discovery with the prime minister's official residence. During the conversation, Mukai read a poem that she had written describing her feeling of being in space "Chuugaeri, Nandomo dekiru, Mujuuryoku" ("Weightlessness, Turn Space somersaults as many times as I like'). Taking Chiaki Mukai's poem as the first half of a tanka (the "kami-no-ku"), we would like you to think up two more lines (the "shimo-no-ku") to make it complete. (Both lines should have seven syllables, making the overall rhythm 5-7-5-7-7.) We would also like you to come up with a pet name for Chiaki Mukai's laboratory assistant - her teddy bear! We eagerly await your entry. 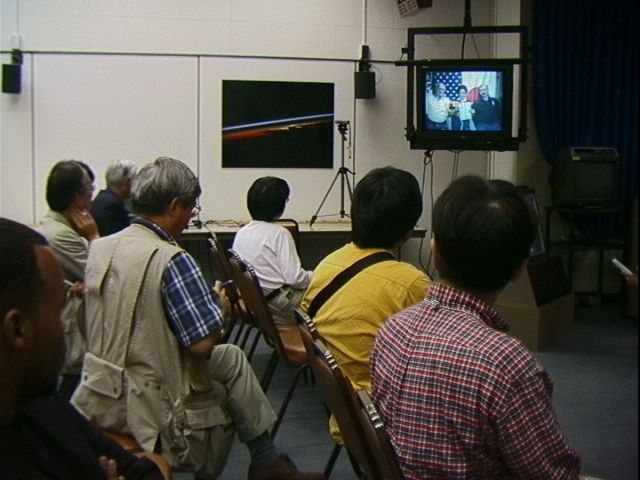 Reporters watching VIP call at JSC.